I have a physical disability that makes it difficult for me to work for someone else, so it is better that I run my own business. Also, my father had a printing business in Guatemala, so I was using a letterpress at seven years of age. I still have a business card I made form a letterpress when I was 12 years old. I later worked in Mexico for eight years and then came to the United States. I was doing glass engraving in my brother’s garage, but for family and friends’ events only, not as a business. What did you learn at MEDA’s Business Development Program? 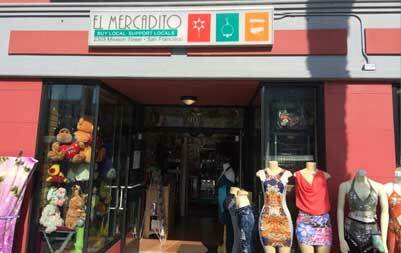 I was looking for work and heard that MEDA offered a free microbusiness incubator, El Mercadito, and was excited at the possibility of starting my own business. I went through the Business Development workshops and then got one-on-one coaching from Jim Escobedo. Everything (laughs). What was most difficult was knowing how to start, especially being in a new country when I came to the U.S. five years ago. There is also a language issue, as my English is not perfect yet. Finally, licensing is difficult to obtain. I got a grant of $1,500 from MEDA. I used this money to set up my business, buying desks, printers and the like. What products do you print the most? My business is pretty evenly spread put. One day it’s flyers, the next it’s posters, the next it’s business cards. My business is steady over the course of the week. It is a challenge to maintain a sufficient client base to more than cover my business costs so that my business can earn me a living. I want to expand, being in a bigger space. Perhaps have three or four employees and I would like to own all of my equipment. That is my goal.